Steven Oh, Global Head of Credit and Fixed Income, PineBridge Investments, discusses investment grade bonds, why investors should consider them in the current market environment and how he believes investors should position their portfolios in light of his outlook for the asset class. Why would investors contemplate investment grade bonds in the current investment environment? Although there’s currently concerns about investing in the investment grade bond market, investment grade bonds have always been and should continue to be part of diversified prudent portfolios. It performs a valuable task of adding a countermeasure to your equity and other higher risk components of your portfolio, or the ability to generate current income for investors as they seek income needs as well. The concerns that really emanate regarding the current environment relate to the fact that we’ve been in an extraordinary condition since the financial crisis, with central bank liquidity enhancements through quantitative easing and through the monetary policies of ultra-low interest rate environments. So as we look forward to a normalisation path of central banks achieving a more normal rate of interest rate path that causes concerns that investors believe that investment grade portfolios could perhaps suffer losses into the future. While those risks need to be taken into account, and the fact that these volatility events going forward will result in much greater dispersion of outcomes, so what it means is that investors should continue in this asset class arena, but potentially rethink how they’ve invested in the past relative to how they should invest going forward. A couple of key broad themes relate to that new investment approach. In an environment where global central banks are likely to be unsynchronised in their approach with the US Fed nearing the end of their normalisation path, but the ECB and BoJ and other major central banks looking to start that path overall, there will be different global outcomes. And so it means that investors should look at investment grade bonds more so on a global basis, not in their domestic markets. And picking and choosing the right securities, not only within each asset class arena, but also picking and choosing the right asset class mix in order to manage both the risks and the opportunities going forward. So the best way to look at investing in investment grade bonds is to look at it more as a global asset class rather than purely as a US or European asset class. In addition, a key component of investment grade bonds that typically is underrepresented is Asian investment grade bonds, where there’s additional yield opportunities, as well as lower interest rate sensitivity risk relative to other developed market areas. Where do you see particular value at the moment? Right now there isn’t much value across broad investment grade markets. However, there are select opportunities that represent better relative value overall. Within that spectrum, we believe that segments including investment grade corporates, as the outlook for corporate earnings are very well supported by the broad fundamental outlook of stable earnings growth, as well as the fact that in the US market the recent tax cuts have resulted in better earnings prospects, cash repatriation and other fundamental benefits to that arena. 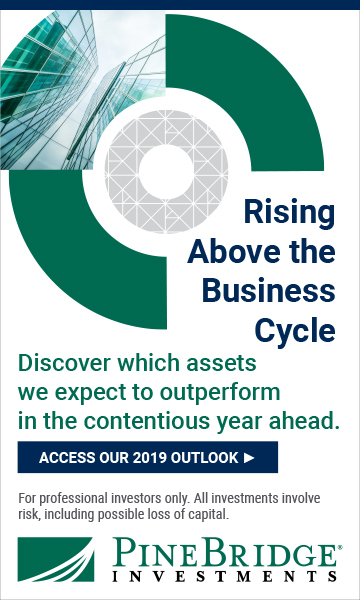 We also believe that select portions of emerging markets with the recent volatility has resulted in much more attractive opportunities, and those opportunities are highly targeted. And so again as with investing across emerging markets or developed markets, rather than taking a wholesale approach one must be more targeted to highlight opportunities and risks in that nature. And then finally we believe there are select niche asset class arenas within investment grade that offer attractive risk-adjusted returns. These areas may include such as European CoCo and preferred securities. Additionally areas such as investment grade CLO securitisation debt tranches, where one is able to get a premium yield in relation to the risk profile in part due to regulatory concerns and other technical factors as opposed to fundamental concerns about the risk enhancement within those arenas. What risks do you see ahead? The key risks in investment grade bonds really relate to the fact that we have been operating in an ultra-low interest rate environment and that rates will go up materially in the future, and inflation may spike. So with investment grade bonds historically the key risk has been growth and inflation, which in turn results in losses in government bonds. However, we do believe that while those risks are present that the path toward normalisation of rates will be a slow and gradual one, and will serve as headwinds rather than simply as meaningful losses within the portfolio. But on top of that, the risks to the other end of the spectrum is that there is some type of a market shock that causes more of the risk components of investment grade bonds to widen out. So these risks are ever present, and investors and managers need to carefully pick and choose by perhaps limiting or reducing some of the interest rate sensitivity, selecting which markets where there may be less risk within the investment grade universe. But at the same time ensuring that your bond portfolio and investment grade bonds serves as a stabilising catalyst for any type of global market shocks that may occur. And as we all are aware there are a number of flashpoints on the horizon, whether it relates to political issues, geopolitical factors, or of course there’s also central bank monetary policy concerns. Investors should position their portfolios in a more dynamic manner, due to the fact that we are likely to see more volatility in the future than we have seen in the past. Historically, investing across broad components of domestic investment grade bonds has worked very well. And it’s worked well in an environment where we’ve undergone a 20-year secular bull market in investment grade bonds. In addition to that, for the past 10 years we’ve had monetary policy through extraordinary measures, which have provided an uplift toward investment grade bonds. Going forward, because we are not going to have those tailwinds, there will be greater dispersion, not only from a geographic standpoint, but additionally within intra-asset class standpoint. And so that means investors need to look at the investment grade bond market much more on a global basis, and targeting which parts of the world that they should be invested in, as opposed to looking purely at their domestic base. Additionally investors need to pick and choose between credit arenas, inflation protected arenas, between sovereign bond risk overall, and invest in a diversified way, but at the same time picking and choosing securities and asset classes that will achieve the best risk-adjusted outcomes over the long term. Well, globally we are going to be in an environment of lower absolute returns. So investing in almost any asset class is going to be more about picking and choosing the right mix of asset classes to achieve a desired outcome, but recognising the fact that we will not have the type of returns that we have had in the past five years overall. So picking and choosing within asset class the right type of securities to generate alpha is becoming increasingly important in an environment where beta returns may be at best tepid. 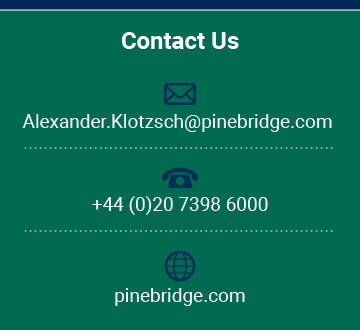 proprietary to PineBridge Investments IP Holding Company Limited. this presentation, such as the assets of PineBridge Investments. content may be confidential, proprietary, and/or trade secret information. distribution of this document to any third parties, in whole or in part. Risk Warning: All investments involve risk, including possible loss of principal. examination of the merits and risks involved. be no assurance that any investment objective will be met. PineBridgeInvestments often uses benchmarks for the purpose of comparison of results. views will come to pass. Actual investors may experience different results. guarantee its accuracy or completeness. and regulated by the Central Bank of Ireland. licensed to provide financial services to individual investors or retail clients. Limited, licensed and regulated by the Securities and Futures Commission (SFC). This document has not been reviewed by the SFC. Financial Services Authority as a Representative Office. suitable to a retail investor and is not reviewed or endorsed by the MAS.